Isaac Lamb is a native of Portland, Oregon and has been performing Defending the Caveman for almost five years–a fact that makes him feel strangely old. 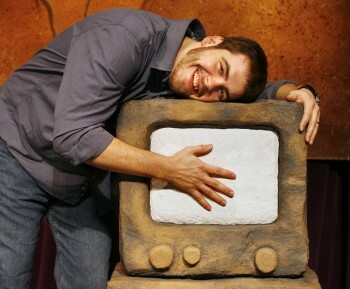 Prior to Caveman, Isaac was privileged to be a part of the Character Company with Meh-Tropolis Dance Theatre in Los Angeles, a member of the Kohl Players (with whom he performed the original one-act play One Sunday in Mississippi), and a graduate of Loyola Marymount’s School of Film and Television. More recently, in between performance dates of Caveman, Isaac played the role of Leon Czolgosz in Assassins (A.R.T. ), Gaston in Beauty and the Beast (N.W.C.T.) for which he won a Drammy Award, and Jewell Estes in Floyd Collins (Stumptown Stages). He also recently starred in the film North Starr, which debuted at the 2008 Sundance Film Festival. Isaac thanks his incredible family, particularly his father and mother who are the best caveman and cavewoman he knows and without whom none of this would be possible…literally.